Emerald Ash Borer has been devastating to a group of trees. Fortunately, about the only good news concerning this insect is that it has not been found in California - yet. But the north east United States is very familiar with it and what it can do. My son and his family moved to Ohio a little over a year ago and bought a home with some acreage. Usually, in Ohio, a home with acreage means you have a lot of trees on your property. My son's property is no exception. He has a small forest of trees around his home. A lot of them are Ash trees - dead ash trees. Not a single survivor of at least 60 ash trees. The maples, oaks and black walnuts, though, are just fine. Emerald Ash Borer is only interested in Ash. This is also the case for most of the northeast - all ash trees are dead. Some have tried to come back from the stumps and seem to be recovering, only to be killed later in the season. It won't be long before all ash trees in the northeast are gone. As you can see from the pictures, this is not a very big beetle. It does its damage in numbers. The beetle is a member of the Buprestidae, known as jewel beetles or metallic wood boring beetles, nearly all of them have some type of metallic coloration and can be very pretty. They are also known as flat headed borers. The head of the larva is flat and damage is done just underneath the bark, at the junction of the first layer of wood and bottom layer of bark. As the larvae sever the food and water vessels in this area, roots starv and water can't be transported to the canopy. The result is a rapid death of the tree. How did this sad story begin? Most likely from contaminated wooden crates, shipped into the US from China, where the Emerald Ash Borer is native. It's not hard to imagine a shipping crate company using some dead Ash trees to make their crates from. Unfortunately, this dead wood still had some borers embedded in it. 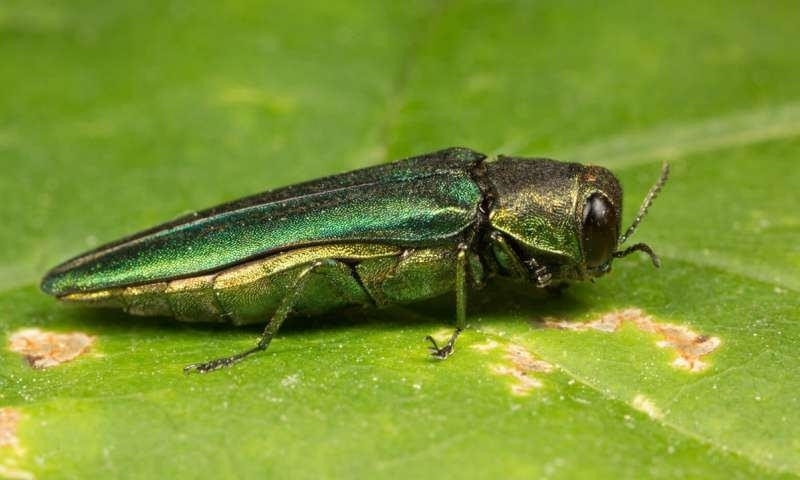 When they emerged in the Detroit area, where they were first found, adults just had to fly a short distance to find more ash trees to infest. But this time it was American ash trees. Most likely introduced without their natural enemies, nothing was around to stop or slow down the infestation, and it rapidly increased over the next few years. As I mentioned, Emerald Ash Borer has not been found in California - yet. Can you imagine the damage and expense to a city like Fresno, that has thousands of Modesto Ash planted as street trees? San Luis Obispo has a good number planted here too. The financial burden to a city or county that has to remove thousands of dead trees could be prohibitive. I don't think the northeast has this type of situation, and most ash trees will just likely die and rot in the forest situation. Many homeowners, my son included, are removing their own dead ashes with help from neighbors. Let's hope that we don't see this beetle in California anytime soon. This example shows how important it is to have a strong port inspection team in place to catch this type of pest insect introduction before it ever gets into the US. If you happen to receive an imported item that has an insect dead or alive in the box, or emerges in your home, please recover the insect and call the county Agricultural Commissioner's Office. They will be very happy to have your help.